KFC Malaysia is giving away up to 2 million Free Legoland tickets for kids (worth RM110 each) with every KFC chicken product purchase of RM30 and above. 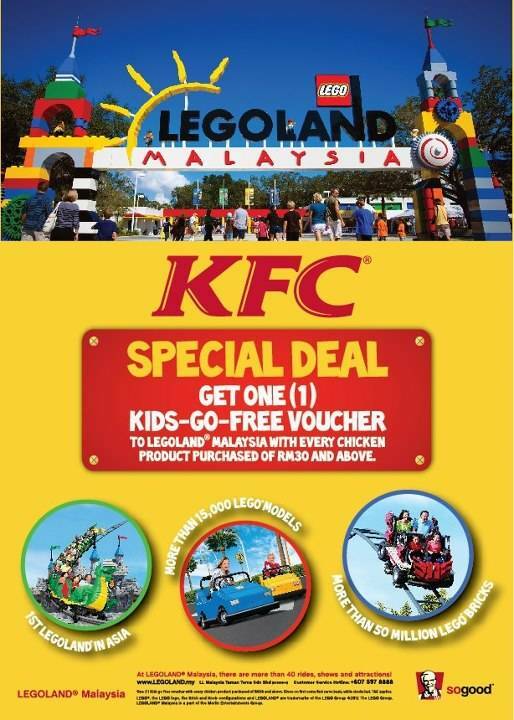 So, don’t forget to request for a KFC Kids-Go-Free voucher for Legoland when you spend RM30 and above at KFC restaurants in Malaysia. Present this voucher upon purchase only at LEGOLAND Malaysia Theme Park at Ticketing Counter. Voucher is valid for a FREE SINGLE-DAY Child Ticket (age 3-11), with the purchase of a full gate price adult ticket to LEGOLAND Malaysia at the same time and day of purchase only. Only one (1) Child Ticket per voucher per full gate price adult ticket. Offer is not applicable for pre-purchase or online sales and cannot be combined with any other discounts, rebates or promotions including Mykad promotion, annual passes, groups and education offers. No photocopies or facsimiles of will be accepted. LEGOLAND Malaysia reserves the right to refuse, alter, amend, delete or add to the stated terms and conditions or withdraw this promotion at anytime without prior notice. This voucher cannot be refunded or exchanged for cash and is not meant for any resale purposes. The voucher is only valid till 31 Dec 2012. Kindly share this great news to all your friends & family members!